This article addresses the sizing of a custom drive for a larger vacuum pump, in the range of 20 to 3000 HP. The small pumps with integral drives have already been sized by the manufacturer, so you need not worry about those. The principles are the same, but the capital cost and power used are much higher in the big pumps so understanding the drive is useful. Given the high cost of capital, energy, and of running a plant, and the much higher cost of having the plant shut down, sizing of the drive becomes a compromise of capital cost, drive efficiency, factor of safety, and future prediction of vacuum needs. Within the factor of safety is the uncertainty of the volume, the vacuum level desired, and the normal process variations. In a previous article, we discussed sizing of the pump which determined the pump horsepower and pump speed. The power indicated in the pump curve is the shaft horsepower at the vacuum pump. The pump is generally not directly driven by a motor, as the pump speed dictates the volume delivered and this speed is quite unlikely to be at the speed of the motor. Above 500 HP (375kw) a gearbox is usually used, and below that a belt drive is generally used. The power loss in the gearbox and couplings will be about 5%, and the drive loss in a belt drive will be about 7%. Therefore, the motor output will be larger than indicated by the pump curve to accommodate this loss. Simply multiply the indicated horsepower by 1 plus the drive loss to get the motor size, then find the next larger motor. Once this motor size is determined, divide the power of the motor by the needed power to find the factor of safety. If this is acceptable, you have the motor sized…almost. As the motor also has losses, the heat generated by these losses has to be carried away, usually by the air flowing through or over the motor. The cooling capacity of the air will vary by the ambient air temperature and the density of the air (think barometric pressure, which decreases with elevation) and the humidity of the air. So a motor rated for 500 HP at sea level may only be good for 340 HP at 9000 feet elevation. The motor manufacturer will be happy to tell just how to figure this all out. Now you have to look at the belt drive or gearbox. The belt drive is simpler, as it is not as seriously affected by the ambient conditions and doesn’t need couplings. You can pick a drive out of the manufacturer’s catalog, in which case you will have to apply the correction factors for the sheave diameters and belt lengths. Also, be aware that a belt drive will put a load on the vacuum pump shaft. Usually, the vacuum pump shaft is designed to accommodate this load, but as belt drives go to higher horsepower with improved belts, the belt tension is going up with resultant higher loads on the shaft. In high compression ratio vacuum pumps or single lobe pumps used as compressors, this can be an issue. Check the power rating of the belt drive versus the load indicated, and see if you are happy with the factor of safety. Generally, the drive will be oversized to a factor of safety of 2. 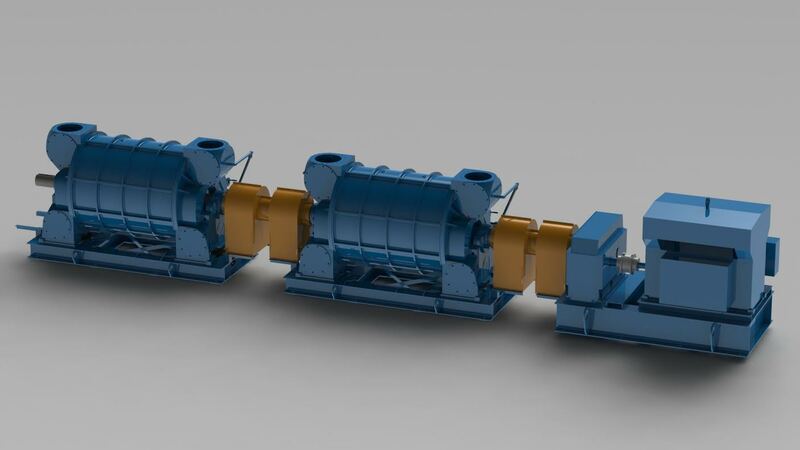 The gearbox is sized by taking into account the speed of the driven shaft, the speed of the output shaft, the power of the driver, the power needed by the pump, and the ambient conditions. The manufacturer will supply a mechanical rating and a thermal rating for the gearbox, and these are almost always different. You will also need the couplings from the motor to the gearbox and the gearbox to the pump. These are typically sized and supplied by the gearbox manufacturer, and come in several types which are outside the scope of this article. Suffice it to say that they are fussy to install or line up and expensive. It had been common practice in the early 20th century to drive the big slow speed pumps with synchronous motors. These motors run at exactly even divisions of 7200 (or 6000 in 50Hz countries). Speeds of 300, 277, 245, 225, and 215 RPM are typical. These motors are usually very large and very expensive so are not commonly used. We do have customer running 3 vacuum pumps with one 3000 HP motor in a recent application, so it is not unheard of. There are very old, very good motors available. There is a more convenient way to size the drive. Call us and we will request all of the variables that we need and we will size the whole thing.